We encourage everyone to keep this tradition alive, especially among the little ones. For many, this is their first time writing a letter, and it can be a magical moment of discovery and awe. In many other countries, it’s enough to address your letters to “Santa Claus” (or his name in your language). For instance, in Portugal you mail your letters to “Pai Natal”, and you’ll get a reply. wonderful post! in german Wikipedia we have this list: https://de.wikipedia.org/wiki/Weihnachtspostamt - maybe you could add a local language Version? Thank you very much! Shouldn't he have a Postcrossing account? Hier werden alle Briefe die einen Absender haben auch beantwortet. Writes back to some senders. Until the end of December the Swiss Post will forward all letters addressed "to Santa" no matter if the address is fictional or random. P.S. From what I've read they also reply to emails sent from outside of Switzerland as long as it's written in one of the three national languages (German, French or Italian) or in English. Might be worth giving a try for those people whos national post office doesn't offer this. Not a adress in The Netherlands? Could anyone tell where would it be in India! No address for Santa in INDIA ? Canada's address for Santa Claus does reply to everyone who writes...all countries. He never wants to disappoint the children...but these letters should be sent early enough to have time to send a reply before Christmas. This is my first time posting to "Santa" ! This year have sent 16 letters to "Santa" all around the world with my 10 yo daughter in the end of October. We got only one from France while but fingers crossing. I only would like to share with you ;-). I find this generation for letters from Russian Ded Moroz, write letters to my friends' kids who live in another countries and send it and envelope pic by e-mail. Also I added colourpages as a small gift. Now the need only print it and put to mailbox. I hope kids will be surprise and happy ;-) to get this surprise. A book with "Letters from Father Christmas" by J.R.R Tolkien (the one from the Hobbit). Every December an envelope bearing a stamp from the North Pole, would arrive for J.R.R. Tolkien's children. It would be a letter in strange spidery handwriting and a beautiful colour drawing. They were from Father Christmas, telling wonderful tales of life at the North Pole. And North Polar Bear messing things up. A hilarious read and very funny drawings. Chişinău, Republica Moldova, Oficiul Poștal Central MD-2012, pentru a lăsa în lădiță scrisorile adresate lui Moș Crăciun. Only til 15 of December. When my children were smaller we did not only write to the German Weihnachtsmann in Himmelpfort, but once tried the one in Finland. He didn't answer at Christmas time. He just wrote a nice letter sitting by a lake in summer. So funny! In Spain there is no Santa’s addresses. But in Navarra (Basque Country) in North of Spain there is Olintzero, is a character in Basque culture and tradition, charcoal by profession. 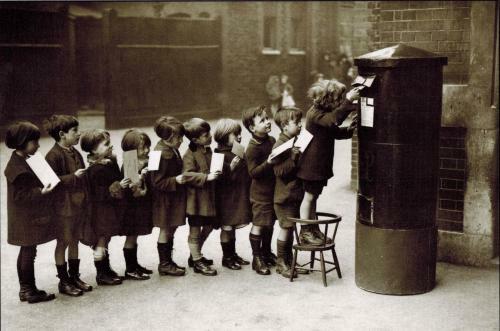 I always find it a bit arrogant of grown up people writing to the Christmas post offices to get back a letter. It is mostly a team of volunteers working there who can hardly manage to answer all the letters from children. Adults trying to collect special postmarks etc. by expecting answers cost those teams an awful lot of time that they would need to write to those kids who still really believe in Santa, maybe had a very tough year and should get so much more attention. If your country does not have an address for Santa you can send your letters to another country - though there is often the question of languages. It is possible to get an answer from the Finnish Santa in 13 languages (Finnish, Swedish, English, Japanese, German, Dutch, French, Spanish, Italian, Chinese, Russian, Polish and Portugese) but unfortunately it costs 7,90 €. That is probably because here the elves have a strong union - or the Finnish postal services are expensive. I was very much delighted to hear of the other Santa's post offices around the world. I wonder if we Postcrossers could do something for those who would love to receive a letter from Santa but do not have an address in their country. Any ideas? In the Netherlands we normally give presents at Saint Nicholas' Day, not at Christmas. Children write wish lists to Saint Nicholas, though usually not by mail. But the rumble about Santa is growing here too. Here in Maastricht is at the moment - the whole month of December - a Christmas Market, including a House of Santa Claus, where you can visit him! If you write to Santa in Canada he replies in all languages that he was written in, including braille. He's a jolly old fellow and tries very hard to please the kids. In Brazil, children write to Papai Noel (Santa Claus). There’s no need to have an address: you just put Santa Claus’ name on it and deliver it at any post office. Adult people go to the post offices and pick out some little letters to patronize them and give the children a gift (as like it was from Papai Noel). Post offices make free delivery of Santa's gifts. Is it alright if I send it to santa claus in other countries? Is there a way to send letters from Netherlands? There is no address for Santa in Southern Basque Country, as our children write to Olentzero, a charcoal maker who is intended to live in a deep forest- even if nobody knows what kind of an address could be there, Anyway, our little people are very lucky, as according to the Spanish tradition they can also write to the Three Wise Men, whose address is very easy: "Bethlehem-Orient". My daughter got the second letter from Canada!!! Thanks Santa! Now I have a question to all members ;-) is it possible to get free letter (by snaimail) from your national "Santa" for kids from another country? This year my 10 yo daughter take part in school project "Letter from Santa". She wrote to letters to different countries.We have sent them in the end of October because Russian post service is too slowly and it take about 2-4 weeks to get the another country. Now we got only two letters back (France and Canada). But we still hope to get more some late. As I know the most countries have free letters only for kids inside country. If you have free post address for xmas letters in your country can you share with me, please? Thanks to all for any information. The project of Postcrossing is giving and receiving. It is such a good project because if we think deeply, this is a fundamental principle of life.If I am pleased to receive cards; I would ask Santa Klaus what could I do in order to give Santa Klaus benefits in what my received postcards concern.